Obituary – Maloch, Lygia Clarease (Fry) « Perry High School Alumni Association, Inc.
H. A. D. E. S. – ’21; Peroma – ’21; Glee Club – ’20; Basketball -’20, ’21; Class play – ’20; Sec.-Treas. – ’18. ﻿Final rites of Mrs. William A. Maloch, 37, former Perry woman, who was killed in an automobile accident Tuesday morning near Coffeyville, Kan., have been set for 2 p.m. Thursday in the chapel of the Newton funeral home, with Rev. Jack Oliver, pastor of the Christian church, officiating. Burial will be in the Grace Hill cemetery. The former Miss Lygia Fry of Perry, was enroute from her home in Winfield, Kan., to visit her parents, Mr. and Mrs. William Rusciene and Avis (Newton) Fry, in Harrison, Ark. at the time of the accident. Mrs. Maloch was born in Perry and grew to womanhood here. 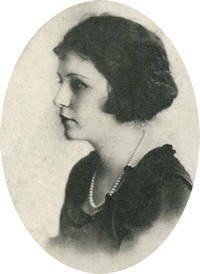 She was a graduate of the Perry high school, and after her marriage to William A. Maloch in 1921, helped her husband manage a book store here for a number of years. Survivors include the widower, William A. Maloch of Winfield: one daughter. Mavis Lee of the home; her parents, Mr. and Mrs. W. R. Fry of Harrison, Ark. ; a brother, W. R. Fry, Jr., of Guthrie; and an uncle, George Newton of Perry.